The new “Captain America” movie—officially titled “Captain America: The Winter Soldier”—is Disney/Marvel’s version of Christopher Nolan’s “The Dark Knight”—a relentlessly entertaining epic action comic book opera that is not afraid to present complex ideas and question the powers that be, not only in the Marvel movie universe, but in our current real-life contemporary society. It is also arguably the best comic book movie since 2008’s groundbreaking “The Dark Knight”. 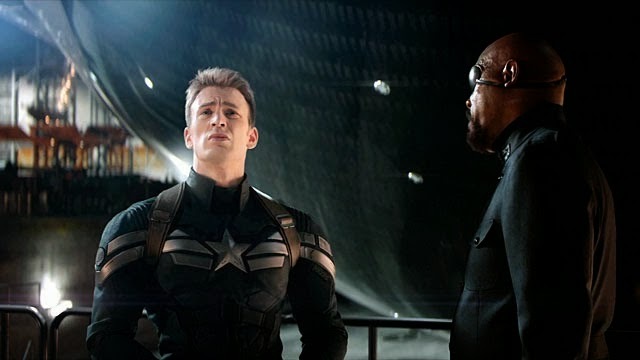 The movie efficiently introduces into Captain America’s world by showing him meeting a new friend (Sam Wilson / Falcon played by Anthony Mackie) during a high speed run. It is a wonderful scene done with just the right touch of humor while reminding us Steve Rogers/Captain America is a man struggling with the adjustment of being thrown seventy years into a future. Chris Evans just is Captain America and this time out he goes beyond just nailing the character and adds more pathos and a new layer of complexity. All of the characters presented in this film have depth and an emotional arc that makes us care about them and at the same time each action they take moves the intricate plot forward at a break-neck speed. “Captain America: The Winter Soldier” is the fastest moving two hour and sixteen minute movie you will ever see. The cast is simply outstanding. Not only do we get Chris Evans, Scarlett Johansson, and Anthony Mackie blazing across the screen with their rock star charisma and electric chemistry, but we also have Emily VanCamp, an appearance by Haley Atwell, the beautiful Jenny Agutter from the 1976 “Logan’s Run”, Samuel L. Jackson bringing a new heavyweight complexity to Nick Fury, and the legendary Robert Redford who nearly steals the whole show as politician with an agenda that unleashes chaos—literally. A word about Scarlett Johansson. There has been talk about “Black Widow” getting her on own spin off movie. Any doubts about whether that would work are eviscerated by this movie and the fierce and emotionally resonant performance Scarlett gives. 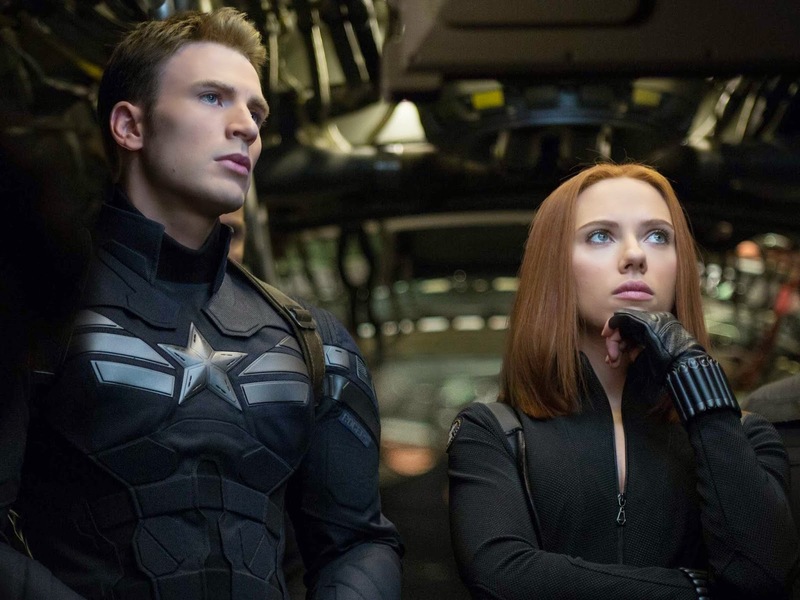 Natasha, like all of the characters in the movie, deepen as scriptwriters Christopher Markus and Stephen McFeely weave their character-oriented action plot. Oh yeah, there is action too; lots of action expertly choreographed and flawlessly executed. This movie has more stunts than a dozen James Bond movies, smash mouth fight scenes rivaling those in “Fast and Furious 6”, and political intrigue on a par with shows such as “24” and “Nikita”. This sequel is superior to the original in every way except two technical ones. Henry Jackman’s serviceable score will not leave you wanting to jump online and buy the soundtrack as Alan Silvestri’s rousing music did. But Jackman wisely keeps Silvestri’s glorious, heroic main theme. Also, “The Winter Soldier” does not look as good as the first film, but that is to be expected since the original was a period piece directed by former ILM art director Joe Johnston. 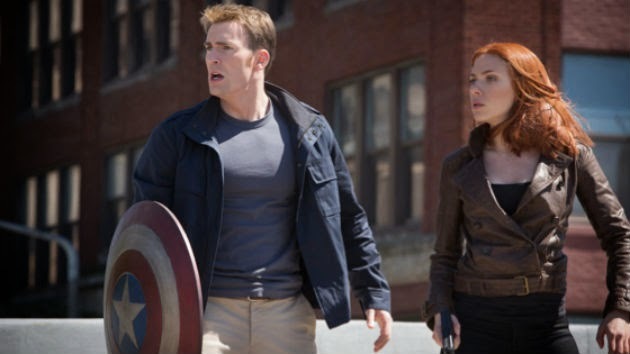 Bottom line: “Captain America: The Winter Soldier” is a smashing sequel—a bold, socially relevant, exciting, politically savvy film with a stellar cast and a deeper, superior story. It is a blast.